Did someone forget the sunscreen? Yep! Attached permanently to his towel, this slow cooking flip flopper loves nothing more that spreading out for that glorious sunshine, maybe a bit too much! All the Official Gnomeo and Juliet garden statues have been a huge hit with all our fans, and just like the others we think you will simply love the way this guy turned out - he is really funny, stone placed standing upwards or beached out any place you lay him down. 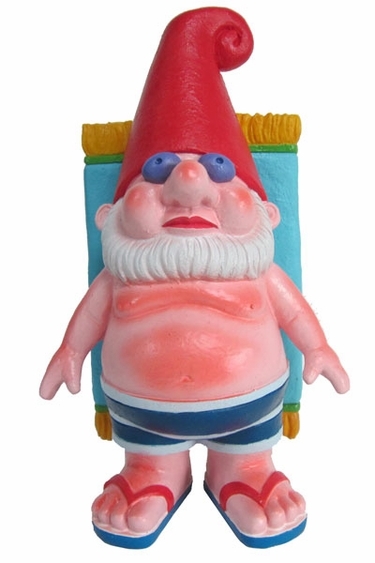 We have a limited production on this sunbathing gnome, so if you just must have him, get him today! Sunbathing Gnome Statue: 7.25"W x 12" tall. Cast Poly-Stone Resin. Hand Painted. Officially Licensed.